On 29th December I attempted to have a go in the World Wide Iron Ham contest. I wasn’t planning on a big entry but was just going to run for a couple of hours to have a break from the Christmas festivities. I fired everything up as usual but when I started transmitting, my Acom 1000 displayed an ARC FAULT error and cut out. Nothing I could do would make it work properly so I gave up, went downstairs and had a mince pie, a glass of beer and watched a James Bond film (Goldfinger). The next day I started investigating the cause of the problem. My first thought was that there was a fault with my aerial so I connected my VNA and checked it – It all measured OK so I looked at the amplifier itself. I ruled this out by running it into my 10m/12m vertical and my 40m delta loop where it worked perfectly. I also fired the amplifier up into a dummy load with no problems indicated. So it’s an aerial fault. 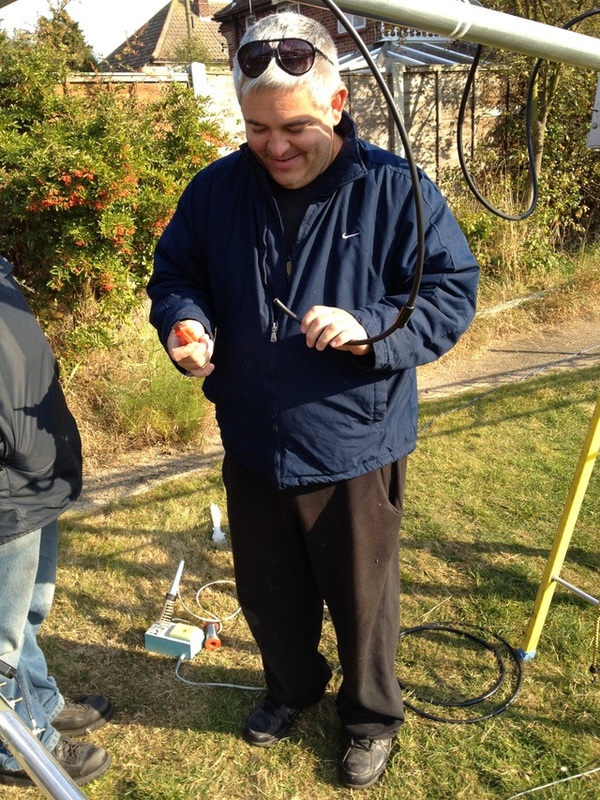 But the aerial checks out OK with the analyser so I thought perhaps the balun was breaking down at high power. I knew the aerial seemed to be performing correctly as I’d used the radio without the amplifier and noticed no problems, working down to Argentina and Brazil on 10m and lots of Europeans on 20m and 15m. Last weekend on Saturday morning I lowered the mast for the first time in months, disconnected the coax from the balun and connected a dummy load. I fired the amplifier up and again, it tripped out so the problem wasn’t the aerial or the balun, it only left the coax. My VNA came out again and the coax all seemed to be OK.
At this point I took a closer look at the PL259 fitted to the coax at the top of the mast and this is what I saw. This connector was originally fitted when my Alimast went up and the only protection it has had against the elements was the rubber boot supplied with the MA5B. It’s clearly suffered from some water ingress and that combined with high power data at a high duty cycle is what’s caused it to break down. I chopped the coax back by six inches, fitted a new compression type PL259 connector and tested with the dummy load and the amplifier on. It worked perfectly so I taped it all up to protect against the weather and raised the mast back up. It had a thorough test in the ARRL RTTY Roundup on Sunday where I worked nearly 500 stations using the amplifier and the hexbeam with no problems. One important thing I’ve learned apart from making sure that connectors are properly insulated and that’s that long handled garden secateurs are absolutely fantastic at cutting through RG213 coax! I’ve also been reminded that I utterly hate and detest PL259 connectors. 8 Responses to Amplifier broken? Aerial broken? 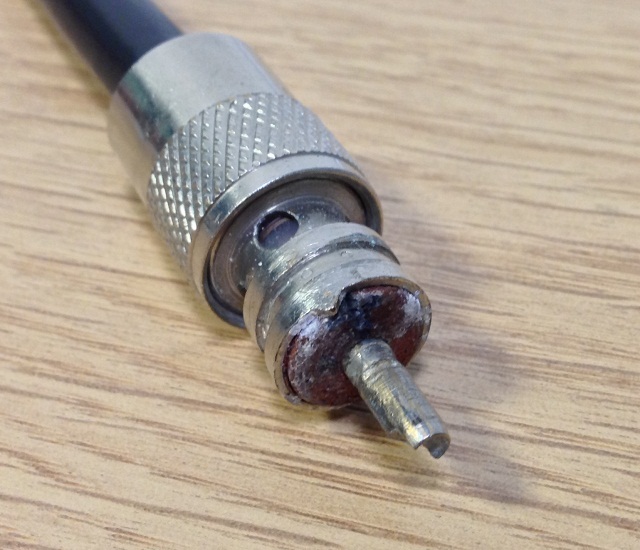 Coax broken? What? It survived very well when the MA-5B was up with the same rubber boot but I guess that the really heavy rainfall we’ve had recently was just too much for it. It’s certainly well waterproofed now though so it shouldn’t happen again. Strangely enough, I do have a roll of heliax which I think will be just about long enough to get up to the rotator so when the weather improves later this year I’m going to look at swapping out the current run of RG213. The heliax will be terminated in N-types but then I’ll need to use short tails of RG213 at each end due to the inflexibility of heliax. It looks like your original PL-259 connector used some sort of cheap and nasty insulation between centre pin and outer. It’s best to aim for PTFE insulation if you’re consistently running high power. These will cost rather more than “50p at a rally” but worthwhile in the long run. By the way, you don’t need a VNA to check for dampness in the feeder. Just disconnect both ends, and measure the DC resistance between inner and outer. It should be many meg-ohms. Interesting, John. I’ve always been led to believe that the brown insulation stuff is better than the while ones because the brown doesn’t melt when it’s soldered. Mind you, I’m going to buy a bag of decent compression type PL259s and replace them all in the shack anyway. I did check the coax with a DVM but it showed OK – It all worked fine when running without the amplifier, it was just the amp that got grumpy so I’m guessing the high power combined with the weakened insulation and perhaps a touch of dampness was the problem. Oddly enough, had exactly the same thing happen on 27-12… Arc fault at anything more than about 250w. I put my other Acom in line and ‘arc fault’ again, so big relief that the amp wasn’t the problem. I then wondered about the 140ft run of LMR 400, but that was fine after plugging it into a cb aerial (bought as emergency cover for 12/10 after mast came down in November), and all was well, no arc fault. Sadly this mean’t something was wrong at the top of the mast, so the lot came down again (after November tumble), and I hooked up direct to hexbeam 20m terminals, no arc fault!. Problem lay in coax with balun on, the plug was a brown bakelite looking plug that looked pretty unhealthy (Ant no longer uses those any more). Replaced easily and all fine now. Change over to “N” types far easier to seal, and are supposed to be waterproof as is. Belt and braces. First wrap with electrical tape, then self amalgamatimg, then another layer of tape. I recenly had to take my feeders of to change antennas, they’d been up over 10+ years, all connectors were bright and shine, no water ingress at all. You only need to do the antenna end if you want, adapters at the shack end will do the job, specially at HF. What you’ve described is what I’ve done with the compression type PL259, three layers of waterproofing so hopefully it won’t happen again. I’m also going to replace all the interconnecting leads in my shack with better quality cable and compression connectors.